The day begins at Sacred Heart Monastery in Louisville, Kentucky, as it has for decades: in prayer. The Passionist priests and brothers in residence at Sacred Heart gather at 7:45 to pray the Office each day, and then Mass begins at 8 a.m. The beautiful chapel fills with warm light that streams through the stained glass windows. The men’s voices resonate in prayer and a sense of peace envelopes the space. A community breakfast follows and then the men head off in a variety of directions. Some of the more active Passionists will head out for preaching or teaching assignments. But because Sacred Heart Monastery has been designated as the Province residence for senior or infirm Passionists, on any given day Br. John Monzyk, the local superior, or Br. 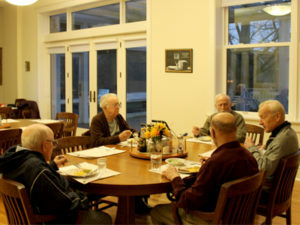 Kurt Wernert, the administrator of assisted living, may be taking one of the several senior Passionists to a doctor’s appointment or conferring with medical staff to ensure that medication is being properly taken. in place, all four pillars and the porch above were painted. This project was completed with the helpful generosity of our benefactors. There is group prayer again in the early evening, but you may also see a Passionist emerging from prayer in the chapel late at night after the others have gone to bed. 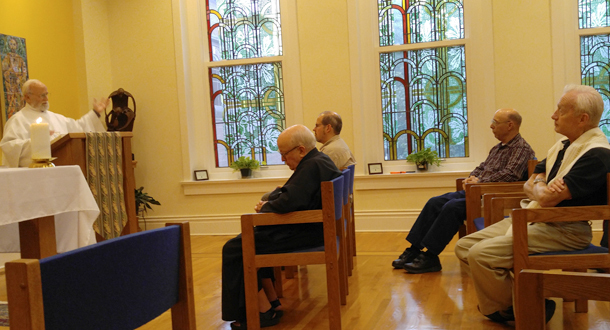 Contemplation is a rich part of Passionist spirituality, along with community life and ministry. In fact, senior Passionists are especially devoted to prayer and view their active prayer life as ongoing service to the Province and Passionist friends and benefactors. Error: Error validating access token: Session has expired on Monday, 18-Mar-19 14:16:37 PDT. The current time is Thursday, 18-Apr-19 17:42:29 PDT.